Where do I use my The Underfloor Heating Store voucher code? The Underfloor Heating Store’s huge range of underfloor heating products offers homeowners and installers flexible solutions to suit any project or budget. Shop for electric underfloor heating, water underfloor heating, thermostats and controls, insulation boards, adhesives and levellers, heat pumps and boilers and even bathrooms and wetrooms. Whatever you’re looking for you are sure to find it online at The Underfloor Heating Store with products like underfloor heating mats, overlay panels, output kits, manifolds, primers, grouts, air source heat pumps and cylinders all available for a low-cost price. If you’re shopping for a new bathroom or are looking to spruce up your existing one then take a look at the bathroom and wetroom section. Here you can find trays and drains, showers, basins, toilets, taps, heated towel rails, wall panels, accessories and bathroom electricals. You can even find information on installation services provided by The Underfloor Heating Store. There are 3 different kinds of electric underfloor heating available at The Underfloor Heating Store from names like Thermoflex, Warmup and Prowarm. Thermoflex systems are one of the most affordable types available; a cost-effective solution for electric underfloor heating. Warmup underfloor heating systems offer both fast and easy to install kits while remaining extremely affordable and efficient to run. And with a lifetime warranty included they are a popular choice. And then there’s ProWarm kits and thermostats, that also comes with a lifetime warranty, as well as a CableSafe Guarantee that’ll give you total peace of mind and a ‘no quibble’ exchange if you cut or damage your heating cable. When selecting your electric underfloor heating you also get to choose one of four main types of systems. These four systems include underfloor heating mats, underwood, carpet and vinyl foil heating mats, underfloor loose wire systems and in-screed heating systems too. There’s a huge array of insulation boards available at The Underfloor Heating Store for both water and electric based systems including tile backer boards, XPS insulation boards and ProFoam insulation boards. As well as this there’s also floating floor panels, solid floor panels, in between joist panels and ProPanel overlay systems available, all at low-cost prices. Floating floor panels are made with high quality extruded polystyrene, covered with a fibreglass mesh on both sides; perfect for under tile heating cables and mats and also wet rooms too. Whether your project is a new build or a major renovation, solid floor panels are guaranteed to suit any underfloor heating system or floor situation. These all in one, easy to fit panels are an ideal solution between existing joists, giving you fast, inexpensive insulation for suspended floors. Then there are ProPanels that utilise an 18mm high-density dry screed board that acts as a heat conducting surface transferring the heat from the pipes to the heated floor above. How hot will my floor get? Your floor will reach a temperature of approximately 28c and will never feel too hot to touch. How high will the system raise my floor level? Our heating cables are 2mm thick but you should also allow 5mm for your tile adhesive and also for the thickness of your tile and any insulation board used. Will the heating sytem heat the room sufficiently on it's own? This depends on a number of factors, including the height of the room and the insulation levels in walls and floor. If insulation boards are used, then the system should heat the room. 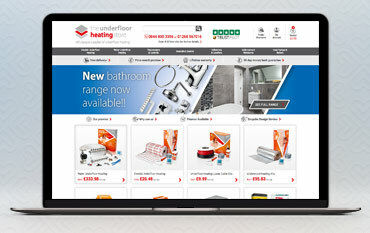 The Underfloor Heating Store is a market-leading online retailer of electric and water underfloor heating systems. Established in 2008 the company has since won numerous awards and provides customers with a 5-star service every time they shop. Customers can buy via the showroom, trade counter, website or call centre, however, if you buy online you gain access to a whole host of exclusive offers including incredible savings with our discount codes and deals. And as the biggest supplier of electric and water underfloor heating systems nationwide, you can rest assured that The Underfloor Heating Store are providing the very best products and services for an affordable price.